From Goodreads: Eighteen-year old Jaycie Lerner’s telekinesis is finally in check – too bad levitating a picnic table is now a workout. Not to mention her previously dormant telepathy is back and raging out of control. As she struggles to manage her frightening power, the Dey-Vah announce they will soon reveal the supernatural world to the human race. To make matters worse, people start dropping dead all over northern Alabama. Then, a mysterious new enemy emerges. Jaycie must elicit the help of the world’s only master vampire slayer and an assassin who converses with the voices in her head. Strengthening the Core is the only way to protect mankind from the coming vampire army, and that’s not even their most dangerous threat. Jaycie and her family face their darkest hour when an innocent young girl serves as a pawn to form a deadly Alliance. The perfect vampire, Lilith Bradshaw, becomes an eye-opening example of how far the Alliance will go to serve their own destructive ends. The world around Jaycie plummets into darkness, and betrayals from the past threaten to undo them all. 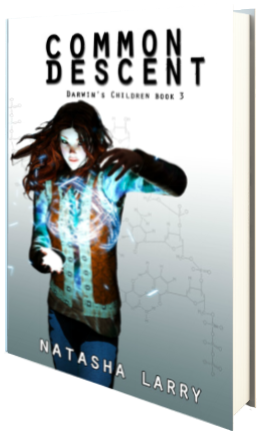 Jaycie Lerner’s story continues in this third installment of the Darwin’s Children series, an action packed ride for those in love with all things paranormal. As is Larry’s nature, this novel indeed picks up where the Unnatural Law left us, and we thrust deep into the storyline from the very first page. As is true in all things, once one aspect of Jaycie’s life within the Core seems fixed, all hell breaks loose elsewhere. Such is the case time and time again as Jaycie, her beau Matt, Haylee, and the entire cast of characters complete or smooth over an aspect within the novel. I almost feel bad for them; while there is some downtime, much of the novel itself is action related as Jaycie attempts to figure out the truth behind her enemies and the growing vampire army intent on destroying everything she holds dear. And yet, these constant events keep the novel hopping with its fast paced nature, easily gluing readers to the pages as it all unfolds. Jaycie and Haylee continued to grow on me throughout this novel, and at this point, I really do love them. As their budding relationships blossom as well, there are some swoonworthy scenes that steal the show, as it were. And as the threats around Jaycie and Haylee abound, I couldn’t help but begin to really fret for their safety, especially at the end, where Larry again throws readers one hell of a cliffhanger. I’m looking forward to the fourth installment already! Four stars.